This year the group continued work related to nanofibre-mediated nonlinear optics in cold atomic systems, particle trapping at the nanoscale and sensing using whispering gallery resonators. Amongst the major outputs were a proposal for atom tractor beam using modes in optical nanofibres, nanoparticle trapping using slotted fibres and a visible fequency comb using microbubble resonators. Aside from research activities, we had our first OIST 5-year unit research review in July 2017 conducted by a panel of international experts, leading to continued funding for the research unit until 2022. We also continued to contribute to outreach activities through the OSA Student Chapter and welcomed many young research interns from all around the world to hone their research skills by spending time with us here at OIST. Finally, three PhD students graduated from the unit this year, bringing to an end our connections with University College Cork, Ireland. While conventional optical trapping techniques can trap objects with submicron dimensions under specific conditions, the underlying limits imposed by the diffraction of light generally restrict their use to larger or higher refractive index particles. As the index and diameter decrease, the trapping difficulty rapidly increases; hence, the power requirements for stable trapping become so large as to quickly denature the trapped objects in such diffraction-limited systems. In this work we presented an evanescent field-based device capable of confining low index nanoscale particles using modest optical powers as low as 1.2 mW, with additional applications in the field of cold atom trapping. Our experiment used a nanostructured optical micro-nanofiber to trap 200 nm, low index contrast, fluorescent particles within the structured region, thereby overcoming diffraction limitations. We analyzed the trapping potential of this device both experimentally and theoretically, and showed how strong optical traps were achieved with low input powers. Opt. Express 24, 14470 (2016). Plasmonic tweezers (PT) based on nano-ring arrays on gold thin film were demonstrated. A cylindrical surface plasmon resonance (SPR) was generated in the aperture of a nano-ring. Numerically, we examined the near-field intensity over the SPR resonance wavelength range. Experimentally, using this plasmonic device, we successfully trapped and transported multiple polystyrene beads with diameters of 30 nm, 500 nm, and 1 µm at low incident laser intensities at 980 nm of less than 1.5 mW/µm2. These PTs demonstrate their potential as elements in lab-on-a-chip devices for µm- and nm-sized bio-particle trapping, manipulation and sorting, since they can provide efficient traps at relatively low powers for an off-resonance laser and with an increased density of trapping sites. Optical frequency combs are one of the most important tools in optical metrology. In recent years, there has been significant and amazing progress in the development of on-chip micron scale frequency combs. The microresonator combs presented in the literature have operating wavelengths in the IR region and it is well known that creating a visible wavelength comb in a microresontor is technically challenging due to the limited control of the dispersion in a typical microresontor. 2016 was an important year for the Optical Cavities and Sensing Group as we were the first group to create a direct Kerr comb in the visible band. This was achieved by using our microbubble whispering gallery resonators, which give us an extra degree of freedom for tuning the resonator’s dispersion. Due to the hard work of Dr Yong Yong and PhD student Sho Kasumie, in collaboration with Prof Lang Yang’s group at Washington University St Louis, we were able to design a microbubble resonator with a zero dispersion wavelength near 750 nm and generate the first visible wavelength Kerr optical frequency comb, see Fig.1. Fig. 1: (Left) calculated zero dispersion wavelength for a microbubble with different wall thickness. (Right) Visible Kerr comb from a microbubble resonator. Optical filtering and signal routing is key to optical data communications and add/drop filters are one of the tools used for such signal processing. Normally add/drop filters require two optical waveguides coupled to an optical resonator. PhD student Ramgopal Madugani in collaboration with Prof Pengfei Wang from the Key Laboratory of In-Fiber Integrated Optics, Harbin University, China, Prof Gerald Farrell from the Photonics Research Centre, Dublin Institute of Technology, Ireland and Prof Gillberto Brambilla from the Optoelectronics Research Centre, University of Southampton developed an add/drop filter which requires only a single waveguide in the form of a directional coupler, see Fig. 2. This simplification gives the device excellent features, such as improved ease of fabrication, multiple resonant peaks, and high mechanical stability. Fig. 2: (Top) Operation of single waveguide add/drop filter. (Bottom) Packaging of add/drop filter. In whispering gallery mode resonator sensing applications, the conventional way to do sensing is by observing the steady-state transmission spectrum through the coupling waveguide. Alternatively, sensing based on cavity ring-up spectroscopy, i.e. CRUS, can be achieved transiently, see Fig. 3. We investigated CRUS using coupled mode equations and found analytical solutions with a large spectral broadening approximation of the input pulse. The relationships between the frequency detuning, coupling gap and ring-up peak height were determined and experimentally verified using an ultrahigh Q-factor silica microsphere. This work shows that distinctive dispersive and dissipative transient sensing can be realised by simply measuring the peak height of the CRUS signal, which can improve the data collection rate for measuring fast transient events. Fig. 3: (left) Principle of CRUS. (right) evolution of mode coupling during CRUS. Micron-sized lasers have many attractive features for sensing applications such as ultra-narrow linewidths and high circulating intensities. One drawback of these tiny lasers is the their lack of tunability, Dr Fuchuan Lei and colleagues have developed a microlaser that can be easily tuned by applying air pressure inside the microresonator. This tuning method is fast, stable and does not increase the footprint of the laser. 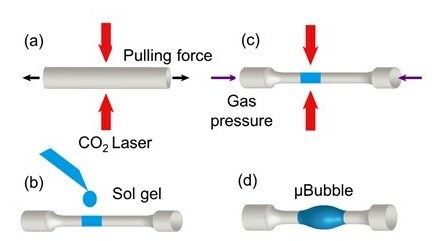 The laser was made from a microbubble microresonator coated with an Erbium doped sol-gel, see Fig. 4. Fig. 4: Fabrication method for tunable microbubble resonator. Optical nanofibers with sub-wavelength diameter have been of great interest for research in quantum optics in recent years. Most of the studies involving ultrathin optical fibers has focused on the fundamental fiber-guided mode. Here, we investigated the interactions between the first higher-order LP11 group of modes of a nanofiber and cold atoms. 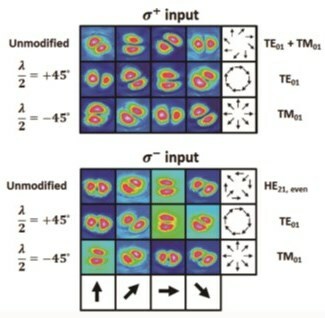 Compared with the fundamental mode, the higher-order modes (HOM) have a stronger evanescent field around the fiber waist to further enhance the atom-photon interaction and the combination of modes could be used to carry orbital angular momentum (OAM). This compact system may open a new path to transfer OAM to atomic systems and implement all-fibered high-dimensional optical memories. We have demonstrated that selective modal excitation of nanofiber is achievable with an ultrathin optical fiber by carefully controlling the phase and polarization of the input probe beam. The interaction strength for a pure mode or a combination of modes can be determined by measuring the absorption spectra of guided resonant light. This make a first step towards the transfer of OAM in atom atom-fiber system (see Figs. 5 and 6). Fig. 5: Experimentally obtained mode selection via a σ+ or a σ− input and analysis of the obtained modes by rotation of a linear polarizer. Arrows at the bottom indicate the principal axis of the analyzer. Fig. 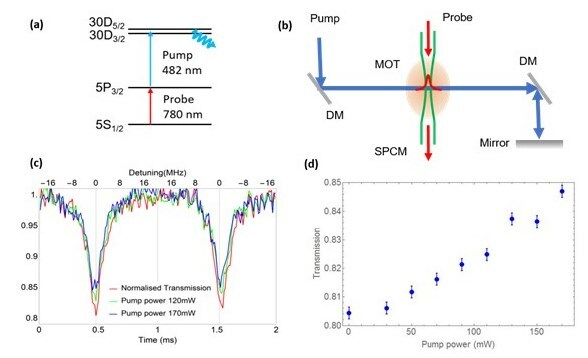 6: (a) Fluorescence coupling into the HOM fiber from resonantly excited atoms when switching on/off the magnetic field of the MOT; (b) Absorption spectra obtained when the resonant probe beam was coupled into the HE11 mode of the nanofiber. Here, we proposed several schemes to realize a tractor beam effect for ultracold atoms in the vicinity of a few-mode nano waveguide. Atoms trapped near the waveguide are transported in a direction opposite to the guided mode propagation direction. We analysed three specific examples for ultracold 23Na atoms trapped near a specific nano waveguide (i.e. an optical nanofiber): (i) a conveyor belt-type tractor beam effect, (ii) an accelerator tractor beam effect, and (iii) a quantum coherent tractor beam effect, all of which can effectively pull atoms along the nanofiber toward the light source. This technique provides a new tool for controlling the motion of particles near nano waveguides with potential applications in the study of particle transport and binding as well as atom interferometry. In this work, we reported on the modification of the local temperature of laser-cooled 87Rb atoms in a magneto-optical trap centered around an optical nanofiber when near-resonant probe light propagated through it. A transient absorption technique was used to measure the temperature of the affected atoms and temperature variations from 160 μk to 850 μk, for a probe power ranging from 0 to 50 nW, was observed. This effect could have implications in relation to using optical nanofibers for probing and manipulating cold or ultracold atoms. In this work, we report on the inference of 87Rb Rydberg formation around an ONF in our cold atom system using a ladder-type excitation as shown in Fig. 7(a). The experimental schematic is given in Fig. 7(b). The 780 nm probe beam is delivered through the ONF while the 482 nm pump beam is in free space. Only the atoms coupled to the evanescent field, which practically extends a few hundred nm from the surface, participate in the Rydberg excitation process. The Rydberg excitation of the atomic population is inferred from the reduction in absorption of the probe light. The transfer of population to the Rydberg state as a function pump power is investigated. The results are compared with an equivalent free space experiment. Fig.7: (a) The energy level diagram. (b) The experimental schematic (c) Reduction in absorption in presence of the pump light (d) Change in transmission of the probe light as a function of the pump light power. Strong matter-photon interaction is essential for successful operation of quantum information protocols. However, an emitter such as single atom or quantum dot does not interact with photons easily in free space due to the diffraction of a tightly focused beam. Historically, there have been two primary methods for overcoming this limitation. The first method is to enhance the interaction by placing the single emitter between two good mirrors. The interaction is enhanced by the roughly the number of times the photon passes the emitter. The second way to increase the interaction strength is to reduce mode area by more tightly confining light mode into the interaction regime. 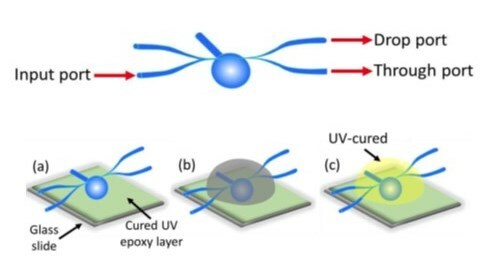 In this perspective, a novel design of an nanofiber based optical cavity which take both methods as mentioned to enhance light-matter interaction, see Fig. 8. Fig. 8: (left) SEM image of a cavity fabricated on an ONF with N = 20. The fiber diameter is ∼ 830 nm, milled-air square length is ∼ 100 nm, fabrication period is ∼ 310 nm and cavity length is ∼ 2.2 µm. (Right) (b) FDTD-simulated transmission spectra of an optical nanofiber cavity. The red solid line corresponds to the x-polarization (x-pol) mode and the black line represents the y-polarization (y-pol) mode with a periodic number of N =20 and a defect length of 2.2μm. (a) Corresponding experimental data. Daly, M., Troung, V. G. & Nic Chormaic, S. Evanescent field trapping of nanoparticles using nanostructured ultrathin optical fibers. Optics Express 24, 14470-14482, doi:10.1364/OE.24.014470 (2016). Han, X., Truong, V. G., Hejazi, S. S. S. & Nic Chormaic, S. Plasmonic trapping based on nanoring devices at low incident powers. Proc. SPIE Optical Trapping and Optical Micromanipulation XIII 9922, 992227, doi:10.1117/12.2236125 (2016). Jyothi, S., Ray, T., Dutta, S., Allouche, A. R., Vexiau, R., Dulieu, O. & Ramgwala, S. A. Photodissociation of trapped Rb2+ : Implications for hybrid molecular ion-atom trapping. Phys. Rev. Lett 117, 1-5, doi:10.1103/PhysRevLett.117.213002 (2016). Kumar, R., Gokhroo, V., Tiwari, V. B. & Nic Chormaic, S. Temperature measurement of cold atoms using transient absorption of a resonant probe through an optical nanofibre. Journal of Optics 18, 115401, doi:10.1088/2040-8978/18/11/115401 (2016). Madugani, R., Yang, Y., Le, V. H., Ward, J. M. & Nic Chormaic, S. Linear laser tuning using a pressure-sensitive microbubble resonator. IEEE Photonics Technology Letters 28, 1134-1137, doi:10.1109/LPT.2016.2532341 (2016). Maimaiti, A., Holzmann, D., Truong, V. G., Ritsch, H. & Nic Chormaic, S. Nonlinear force dependence on optically bound micro-particle arrays in the evanescent fields of fundamental and higher order microfibre modes. Scientific Reports 6, 30131, doi:10.1038/srep30131 (2016). Mekhail, S. P., Arbuthnott, G. & Nic Chormaic, S. Advances in fibre microendoscopy for neuronal imaging. Optical Data Processing and Storage 2, 30-42, doi:https://doi.org/10.1515/odps-2016-0003 (2016). Mekhail, S. P., Jáidar, O., Arbuthnott, G. & Nic Chormaic, S. Fiber Bundle in-vivo Epifluorescence Microscopy with Image Reconstruction. OSA Technical Digest (online) (Optical Society of America, 2016) Biomedical Optics 2016, JW3A.26, doi:10.1364/CANCER.2016.JW3A.26 (2016). Nieddu, T., Du, J. & Nic Chormaic, S. Atom-photon interface using the higher order modes of an ultrathin optical fiber. Frontiers in Optics 2016 OSA Technical Digest (online) JTh2A, 34, doi:https://doi.org/10.1364/FIO.2016.JTh2A.34 (2016). Sadgrove, M., Wimberger, S. & Nic Chormaic, S. Quantum coherent tractor beam effect for atoms trapped near a nanowaveguide. Scientific Reports 6, doi:10.1038/srep28905 (2016). Sergides, m., Truong, V. G. & Nic Chormaic, S. Highly tunable plasmonic nanoring arrays for nanoparticle manipulation and detection. Nanotechnology 27, 365301, doi:10.1088/0957-4484/27/36/365301 (2016). Wang, P., Madugani, R., Zhao, H., Yang, W., Ward, J. M., Yang, Y., Farrell, G., Brambilla, G. & Nic Chormaic, S. Packaged optical add-drop filter based on an optical microfiber coupler and a microsphere IEEE Photonics Technology Letters PP, 1-4, doi:10.1109/LPT.2016.2591959 (2016). Ward, J. M., Yang, Y. & Nic Chormaic, S. Glass-on-Glass Fabrication of Bottle-Shaped Tunable Microlasers and their Applications. Scientific Reports 6, doi:10.1038/srep25152 (2016). Yang, Y., Jiang, X., Kasumie, S., Zhao, G., Xu, L., Ward, J., Yang, L. & Nic Chormaic, S. Four-wave mixing parametric oscillation and frequency comb generation at visible wavelengths in a silica microbubble resonator. Optics Letters 41, 5266-5269, doi:https://doi.org/10.1364/OL.41.005266 (2016). Yang, Y., Lei, F., Kasumie, S., Xu, L., Ward, J., Yang, L. & Nic Chormaic, S. Tunable erbium-doped microbubble laser fabricated by sol-gel coating. Optics Express 25, 1308-1313, doi:https://doi.org/10.1364/OE.25.001308 (2017). Yang, Y., Madugani, R., Kasumie, S., Ward, J. & Nic Chormaic, S. Cavity ring-up spectroscopy for dissipative and dispersive sensing in a whispering gallery mode resonator. Applied Physics B 122, 291, doi:http://dx.doi.org/10.1007/s00340-016-6565-y (2016). Daly, M., Truong, V.G. and Nic Chormaic, S. Evanescent tapping using nanostructured ultrathin optical fibres (contributed talk): IONS KOALA 2016, Melbourne, Australia. 28 November (2016). Du, J., Nieddu, T., Ray, T., Subramonian Rajasree, K., Kumar, R., Gokhroo, V. and Nic Chormaic, S. An efficient light-atom interface based on higher-order modes of an optical nanofiber (contributed talk): ONNA2016, Hangzhou, China. 24 October (2016). Gokhroo, V., Kumar, R. and Nic Chormaic, S. Nonlinear optics in cold87Rb atoms at ultralow powers via an optical nanofiber (contributed talk): 17th Annual Meeting of the APS Northwest Section, Pencticton, British Columbia, Canada, 14 May (2016). Gupta R K. Towards: Characterising the light-matter interactions of Rb-85 vapor in a microbubble-type WGM resonator (poster): CQD2016, Okinawa, Japan. 30 September (2016). Han, X., Truong, V.G., Hejazi, SSS. and Nic Chormaic, S. Submicron particle trapping and manipulation with plasmonic nanoring devices (contributed talk): OMC'16, Yokohama, Japan, 19 May (2016). Kasumie, S., Yang, Y., Jiang, X.F., Zhao, G.M., Xu, L.H., Ward, J., Yang, L. and Nic Chormaic, S. Frequency comb generation at visible wavelengths in a silica microbubble resonator (poster): CQD2016, Okinawa, Japan. 30 September (2016). Lei, F., Yang, Y., Kasumie, S. and Nic Chormaic, S. Tunable Yb-Er co-doped microbubble laser (poster): CQD2016, Okinawa, Japan. 30 September (2016). Mekhail, S.P., Jaidar, O., Arbuthnott, G., and Nic Chormaic, S. Fiber bundle in-vivo epifluorescence microscopy with image reconstruction (poster JW3A.26). Optics and the Brain 2016, Fort Lauderdale, Florida, USA, April (2016). OSA Biomedical Optics Student Poster Presentation Prize Finalist. Mekhail, S.P., Jaidar, O., Arbuthnott, G., and Nic Chormaic, S. Fiber Bundle Image Reconstruction for In-vivo Endoscopy (poster): Biophotonics and Imaging Graduate Summer School (BIGSS), Galway, Ireland, 8 September (2016). Mekhail, S.P., Ward, J., Arbuthnott, G. and Nic Chormaic, S. Fibre-bundle-basis compressive sensing for in-vivo endoscopy (contributed talk): The 64th JSAP spring meeting, Yokohoma, Japan. 16 March (2017). Nic Chormaic, S. Optical nanofibres for probing and mainpulating cold atoms (contributed talk): International Workshop on Many-Body Physics in Synthetic Quantum Systems, Stellenbosch University, South Africa, April (2016). Nic Chormaic, S. Hollow whispering gallery resonators (invited talk): EMN Optoelectronics Conferece, Phuket, Thailand, April (2016). Nic Chormaic, S. Manipulating atoms using optical nanofibres (invited talk): C3QS, Okinawa, OIST, Japan, April (2016). Nic Chormaic, S. Nanostructured ultrathin optical fibres for particle trapping (invited talk): OMC'16, Yokohama, Japan, 20 May (2016). Nic Chormaic, S. Towards Rydberg atoms near the surface of ultrathin optical fibres (contributed talk): Workshop on Correlation and Order in Rydberg Gases, Leiden, Netherlands, 02 June (2016). Nic Chormaic, S. Atom-light interactions using ultrathin optical fibres (COST meeting talk): COST MP1403 WG4 Meeting @Quantum Simulations and Many Body Physics with Light Workshop, Crete, Greece, 09 June (2016). Nic Chormaic, S. Madugani, R., Kasumie, S., Ward, J. and Yang, Y. Whispering gallery resonators for nonlinear optics and optical manipulation (contributed talk): PIERS 2016, Shanghai, China, 09 August (2016). Nic Chormaic, S., Nieddu, T., Subramonian Rajasree, K., Kumar, R., Gokhroo, V., Ray, T. and Du, J. Neutral 87Rb atoms near the surface of optical nanofibres (invited talk): PIERS 2016, Shanghai, China, 10 August (2016). Yang, Y., Jiang, X., Kasumie, S., Zhao, G., Xu, L., Ward, J., Yang, L. and Nic Chormaic, S. Frequency comb generation at near visible wavelengths in a microbubble resonator (contributed talk): FiO/LS 2016, Rochester, USA. 21 October (2016). Nic Chormaic, S. Particle manipulation using ultrathin optical fibres (invited talk): ONNA2016, Hangzhou, China. 24 October (2016). Nic Chormaic, S. Ultrathin optical fibres for studies on cold Rb atoms (invited talk): OIST-JST PRESTO Joint Symposium on Frontiers in Optics and Photonics, OIST, Japan. 31 October (2016). Nic Chormaic, S. Sensing in a bubble (invited talk): Workshop on Optics Technology for Sensing Applications, ACP 2016, Wuhan, China. 2 November (2016). Maimaiti, A., Truong, V.G. and Nic Chormaic, S. Ultrathin optical fibers for particle trapping and manipulation (invited talk): ACP 2016, Wuhan, China. 3 November (2016). Nic Chormaic, S. Ultrathin optical fibres - what are they and how can we use them (plenary talk): IONS KOALA 2016, Melbourne, Australia. 28 November (2016). Sponsored by OSA Traveling Lecturer Program. Nic Chormaic, S. Ultrathin optical fibres - from fabrication to application (invited talk): CSIR, Pretoria, South Africa. 2 December (2016). Sponsored by OSA Traveling Lecturer Program. Yang, Y., Kasumie, S., Ward, J., Zhao, G., Xu, L., Jiang, X., Yang, L. and Nic Chormaic, S. A frequency comb at visible wavelengths using a microbubble resonator (invited talk): The 33rd Advanced Photon Science Alliance Seminar on Frequency Comb Technologies, Keio University, Japan. 03 March (2017). Nieddu, T., Du, J. and Nic Chormaic, S. Selective excitation of higher order nanofiber modes and their interaction with cold atoms (poster): CQD2016, Okinawa, Japan. 30 September (2016). Nieddu, T., Du, J. and Nic Chormaic, S. Atom-photon interface using the higher order modes of an ultrathin optical fiber (poster): FiO/LS 2016, Rochester, USA. 20 October (2016). Nieddu, T., Du, J., Nic Chormaic, S. Interaction between cold atoms and selectively excited higher order modes of an ultrathin optical fiber (contributed talk): The 64th JSAP spring meeting, Yokohoma, Japan. 16 March (2017). Subramonian Rajasree, K., Ray, T. and Nic Chormaic, S. Towards Rydberg atoms near an optical nanofibre (poster): Les Houches Summer School on Current Trends in Atomic Physics, Les Houches, France, 06 July (2016). Subramonian Rajasree, K., Ray, T. and Nic Chormaic, S. Towards Rydberg atoms near an optical nanofibre (poster): CQD2016, Okinawa, Japan. 30 September (2016). Subramonian Rajasree, K., Ray, T. and Nic Chormaic, S. Cold Rydberg atoms near an optical nanofibre (contributed talk): The 64th JSAP spring meeting, Yokohoma, Japan. 16 March (2017). Sergides, M., Truong, V.G. and Nic Chormaic, S. Phase tunable anisotropic metamaterials for nano-object detection and manipulation (contributed talk): OMC'16, Yokohama, Japan, 20 May (2016). Kumar, R., Gokhroo, V., Truong, V.G. and Nic Chormaic, S. Nonlinear optics phenomena in laser-cooled atoms at ultralow powers via an optical nanofiber (contributed talk): CLEO2016, San Jose, USA, June (2016). Truong, V.G., Maimaiti, A. and Nic Chormaic, S. Manipulation of particles using higher order modes in an optical microfiber (contributed talk): CLEO2016, San Jose, USA, June (2016). Truong, V.G., Han, X., Sergides, M. and Nic Chormaic, S. Plasmonic nanoring devices for micro- and nanoparticle trapping and detection using low incident laser powers (contributed talk): PIERS 2016, Shanghai, China, 08 August (2016). Truong, V.G., Maimaiti, A., Daly, M. and Nic Chormaic, S. Multiple particle trapping and self-organization in the evenescent fields of optical micro- and nanofibres (contributed talk): PIERS 2016, Shanghai, China, 08 August (2016). Truong, V.G., Han, X., Gurkan-Ozer, A., Sergides, M. and Nic Chormaic, S. Localised plasmonic resonances of nanoring apertures for nanoparticle trapping (contributed talk): Optics & Photonics Japan 2016, Tokyo, Japan. 30 Oct (2016). Ward, J. Whispering Gallery Resonators for Sensing and Nonlinear Optics (invited talk): ALT16 (Advances in Laser Technology), Galway, Ireland. 12-16 September (2016). Ward, J. Light-Matter Interactions at OIST (invited talk): International Seminar in Biwako, Shiga, Japan. 27-29 September (2016). Yang, Y. Applications in whispering gallery mode resonators (contributed talk): Xinghai Forum, Harbin, China, May (2016). Yang, Y., Jiang, X., Kasumie, S., Ward, J., Yang, L. and Nic Chormaic, S. Frequency comb generation using hollow whispering gallery mode resonators (contributed talk): ONNA2016, Hangzhou, China. 25 October (2016). Nic Chormaic, S. Optical nanofibres for probing and manipulating cold atoms (seminar): Quantum Research Group, University Kwazulu-Natal, South Africa, April (2016). Nic Chormaic, S. Ultrathin optical fibres and their applications (seminar): Physics Dept., University College Cork, Ireland. 14 November (2016). Nic Chormaic, S. Using ultrathin optical fibres to trap particles (seminar): School of Physics & Astronomy, Monash University, Australia. 25 November (2016). Nic Chormaic, S. Ultrathin optical fibres - fabrication and applications (seminar): School of Chemistry and Physics, UKZN, Durban, South Africa. 08 December (2016). Sponsored by OSA Traveling Lecturer Program. Truong, V.G. Optical nanofibres and plasmonic nano-tweezers for nano-object trapping and manipulation (seminar): OIST internal seminar, Okinawa, Japan. 16 December (2016). Yang, Y. Optomechanical and nonlinear properties in micropendulums and microbubble resonators (seminar): University of Washington St. Louis, USA, April (2016). Title: How many pixels does your camera have? Ours has only one! Prof. Nic Chormaic was promoted to Full Professor from Associate Professor in September 2016.